How many of you have heard this request: "Hi, there! How's it going? I know you're busy with that convening tomorrow, but can you send me any relevant data on the impact of our funding? I need it by the end of this week for a presentation...board meeting...foundation newsletter. Thanks!" You know the drill. Today's foundation program staff's job descriptions are expanding to include the ability to make grants that have a measurable impact. Inherent in that responsibility is your ability to collect and analyze outcome-related evidence: How do we know that our grants are having an impact? How is our support helping (or not)? What have been the effects of our grants—planned or unplanned? If these are your set of evaluation questions, this thought has likely also crossed your mind: How do I make sense of all the information from site visits, phone calls, conversations with the field, and grant report documentation (videos, narratives, studies, articles)? I know that we're having an impact, because I hear, read, and see it, but when it comes to collecting it for a report, it's hard to know where to start! Oftentimes, this material sits in a cabinet until an evaluation opportunity comes up when, more likely than not, the consultant asks you for all this material. Or, maybe you’re one of the lucky ones who actually has an evaluation expert on staff to manage all this information. Either way, an under-recognized software tool that foundations should consider using is data analysis software. 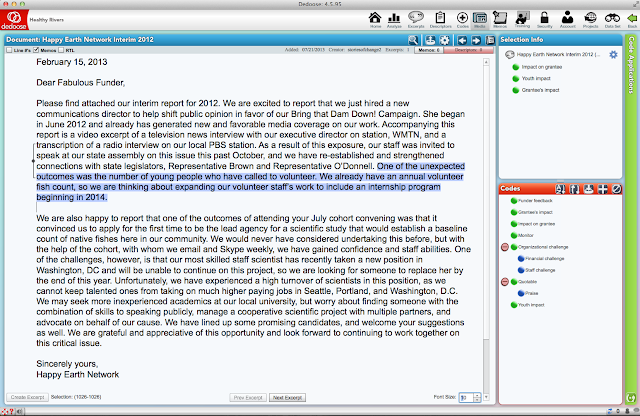 This software should be considered just as essential as your grants management software. In this post, I’m going to describe how to get started with one data analysis software called Dedoose. I’m definitely not getting paid to promote them (they don't even know I exist), and this is really just an opportunity to share my positive experience with this product. To start, data analysis software is a tool that can be used to analyze information that you have locked up in volumes of grants reports. These software (and there are many competing products) are often used by researchers for statistical data analysis in quantitative research and/or for qualitative research to organize and identify patterns in text-, visual-, or oral-based materials. Given that the primary users of data analysis software are scientists, most are pretty technical, not very user friendly, and not cheap. I’ve been using NVivo (for qualitative) and SPSS (for quantitative), and they take a while to learn how to use, which is a reason why such products don’t get picked up outside of academia or research work. When I first encountered Dedoose, I was really impressed. I had a Eureka! moment when I first used it, because it was just so darn easy to use and holds so much promise for making all that grant report content (there's probably miles of it stacked in cabinets all across America) actually become relevant to outcome-focused work. What grantees don't realize is that their reports sit in cabinets not because of a lack of interest, but because it's 1) overwhelming to go back to them after an initial reading because there's just so many, and 2) it's difficult to transform the information into usable data without involving a lot of work. This is why program staff might have favorite writers to return to time and again when it's docket report-writing time or may keep a running document of good quotes that they update--both pretty spotty and clunky efforts. I promised a colleague that I would help set up the technological infrastructure of their grantmaking program to operationalize their evaluation process. In other words, I am helping them organize their grant reports and other material evidence of grant impact so that they can pull up stories and documentation of their grant effects easily. So, instead of writing a procedures document just for them, I’m using this opportunity to share this with all of you. To start, let’s create the scenario. You are an environmental program officer working on two portfolios—healthy rivers and alternative fuels. In your healthy rivers portfolio, you have a cohort of grantees who are all part of a 2010-2013 multi-year funding cycle of advocacy-based organizations. In this portfolio, you just received an interim grant report from the fictitious Happy Earth Network, which received a three-year grant of $300,000. 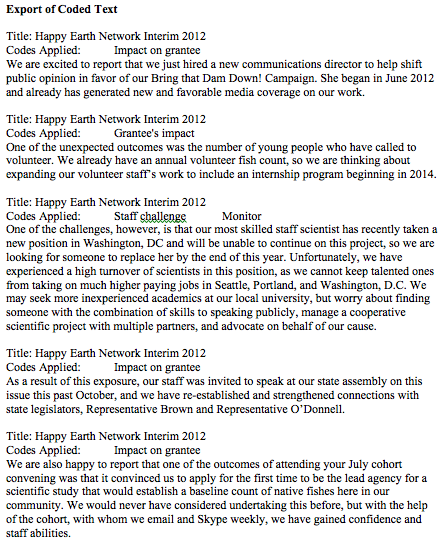 In it, they described what they accomplished in 2012 because of your funding. They are super excited about the many objectives they met. What are the objectives of my program’s funding? In this case, let’s say your program’s objective is to restore native salmon runs by dismantling dams in rivers where the environmental and social costs exceed the economic benefits. What should I be looking for to know if objectives are being met? You should have several indicators, so let’s use three as examples of outputs, outcomes, and impact. Output: Using your grant, grantee hires a communications director to sway public opinion in favor of dam removal. Outcome: Dam is removed. Impact: Salmon populations achieve sustainable levels in dam-removed watershed. What indicators should I be looking for? Achieving more than output-level results is challenging, so you need to track the indicators of trends moving toward (or away from) hoped-for outcomes and impacts. Given the three levels of objectives listed, here are some examples of indicators: Output-level change indicator: Number of Happy Earth Network’s Facebook followers climbs to indicate public recognition; Outcome-level change indicator: Grantees report swaying politicians to their side; Impact-level change indicator: Scientifically commissioned report shows salmon runs are re-appearing. So, back to Dedoose. The first thing you want to do is to think about how your stakeholders will want to slice and dice the data based on organizational or grantmaking categories. Dedoose calls these “descriptors.” Will you need to demonstrate how a particular grantmaking portfolio is doing? Is your foundation starting to expand its grantmaking to include, for instance, minority-led organizations? Think about what information you might want for foundation communications: Maybe this year’s annual report will showcase grantmaking in rural communities. In other words, anticipate how you want to categorize your grantees. These categorical buckets will enable you to organize and call up the data based on grantees’ demographic, organizational information. For this example, let’s say that these categories are: ID #(this should be the same identifying number you use in your grants management and files), Grant Program (Environment), Grant Portfolio (Healthy Rivers), Cohort (Healthy Rivers-Advocacy Building), Grant amount ($300,000), Budget Size ($2 million), Org Founded (1995), Organization Name (Happy Earth Network), Minority-Led (yes—Happy Earth Network is led by a Latina), Location of Grantees’ Office (Montana). Next, return to your Theory of Change and look at your indicators. These are, according to Dedoose, going to be your “codes.” Now coding is a big deal. It’s the most important reason why you would turn to data analysis software in the first place. Making up precise, targeted, and relevant codes is what will enable you to call up useful grant report content and transform a 15-page narrative report from Happy Earth Network into a powerful data source. 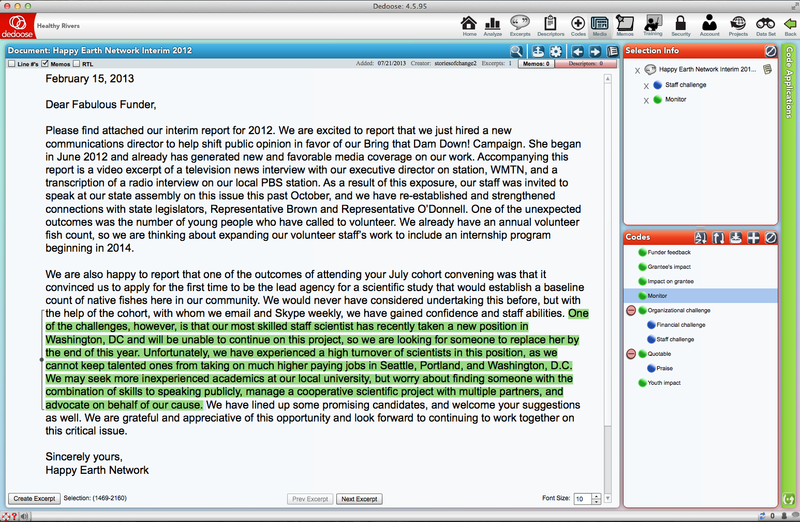 Being able to quickly pull up relevant data, which has been separated out from a lot of stuff that you don’t need, will help you generate communications content, write to-the-point docket reports that are enlivened with relevant grantee quotes, and be ready to analyze the coded content to spot trends, gather evidence of the trends, and analyze trends. In turn, all this will help you distribute more targeted, responsive grants and discern if your grantmaking strategy needs to change in order to better reach your objectives. When I’ve used codes to look for problems in grantmaking approach, that docket report section pretty much writes itself when I see the relevant data excerpted from grant reports on that topic. I suggest starting with the following as broad categorical codes to start: (a) grant impact on organization and/or its staff, (b) the organization’s impact on the field, audiences/public, and/or influentials, (c) challenges that grantee is facing, (d) grantee suggestions for improving your foundation's grantmaking, (e) grantee's praise of your foundation/board/staff, (f) board/boss-specific information, (g) quotes that can be used for communications and docket reports, and (h) items to monitor. Code names should be concise, so just use "monitor" instead of "items to monitor." The codes you select are also quite personal and should reflect the character, interests, and objectives of your foundation. Let's pretend that an interest in youth is consistently shared across all your foundation's grantmaking programs, so I've used the code "youth impact" for examples of impact on youth. Keep in mind, codes should be meaningful enough that everyone in your foundation is applying the same codes consistently. (Note, Dedoose allows individual users to review their coded work so they can compare their coding work with others, which will help avoid inter-reliability issues.) Ultimately, you want just the right amount of codes to find the information you need--not too broad that they bring up meaningless data, not too fine that the information you want doesn't come up, and not too many that you're overwhelmed by codes. 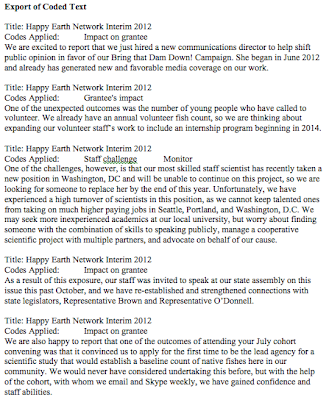 Here’s an example of coding Happy Earth Network’s interim grant report. You can see the codes I made up in the bottom right box labeled “Codes.” In the large field is the grant report. I thought that these two sentences, which I highlighted and then made into an "excerpt," indicate how Happy Earth Network used their grant, is affecting public perception, and is exciting youth attention to their cause. 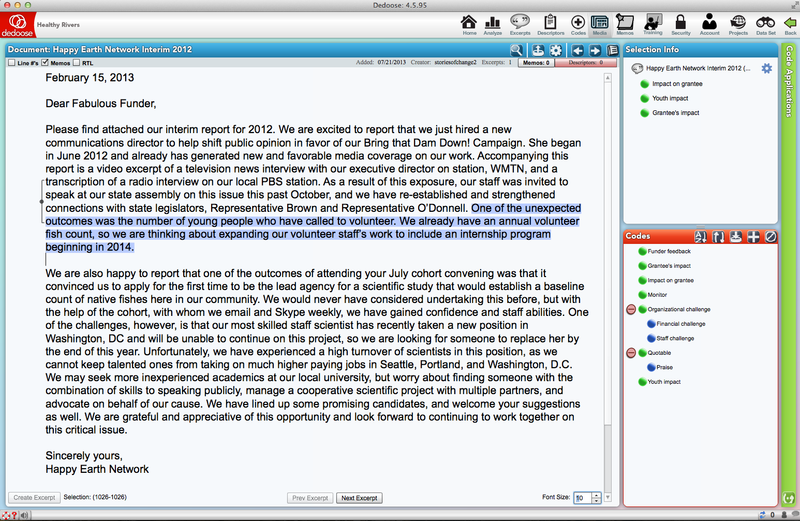 Hence, I assigned the following codes: "impact on grantee," "youth impact," and "grantee's impact." You can assign as many codes as you like to your selection. The idea is that every time you want to generate a report of all content that was assigned a code, such as "impact on grantee," only this content will be gathered and displayed together, with all other content filtered out. Here's another example: I selected these sentences (highlighted in green), which are about Happy Earth Network's current organizational challenge (they have a hard time retaining scientists in their rural, low-paying community). At some point, when I want to review all the different kinds of challenges my grantees are facing, I can generate a report of just those selections coded "staff challenge" to analyze for any trends. I also coded this same selection "monitor" to remind me that I want to follow up on how Happy Earth Network is doing with hiring and retaining skilled staff. And, here's what the document looks like when I'm done coding. Notice that some sentences don't get any coding at all, while others (as in the examples above) got one or more codes. It looks quite messy, but you'll never need to look at this document in this state again. (If you want to read original grant reports, remember that your grants management system is the best place for managing and reviewing this kind of material. Data analysis instruments are just for analyzing the content.) Upon coding, you can forget about reading this grant report in this long narrative format. You, or your program associate, just read it in order to code it--now you just want to be able to call up the relevant bits. As an example, let's say you want to review only information that is relevant to how your grantmaking affected your grantees. Remember you have a code for this, so you can export all data coded "impact on grantee." Here's an example of how Dedoose exports this information (you can export it as an Excel or Word document--either one makes it easy for you to cut and paste for your report writing). I've only coded one organization in this example, Happy Earth Network, but if we had other grantees' reports, their data would also come up under this code assignment. 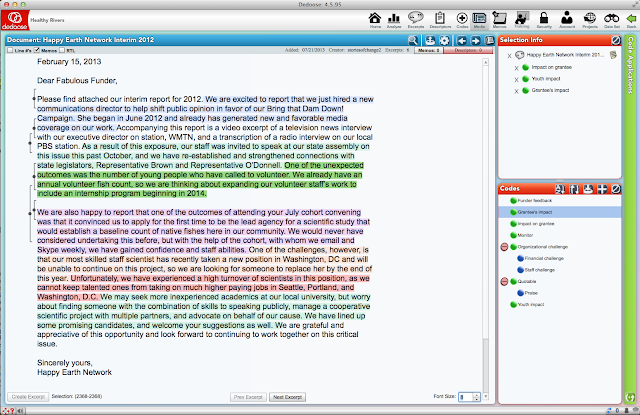 Keep in mind that you can upload and code not only grant reports, but also your site visit notes, transcripts of recordings, reviewers' notes, media coverage--anything that can be selected as text for you to assign codes. Also, remember your descriptors? You can apply a filter for only those types of organizational characteristics you want to examine. For instance, you can review the codes of only organizations in your grant portfolio (1st descriptor) that are in the current cohort (2nd descriptor). You can use Dedoose as an individual program officer, or this tool can be used throughout the foundation. There's healthy competition in the world of data analysis software, trying to make them easier and more powerful to use. A couple years ago, when I didn't know about Dedoose, I would never have suggested using data analysis tools for nonprofits, unless they were actually doing social science research and high-end evaluations. 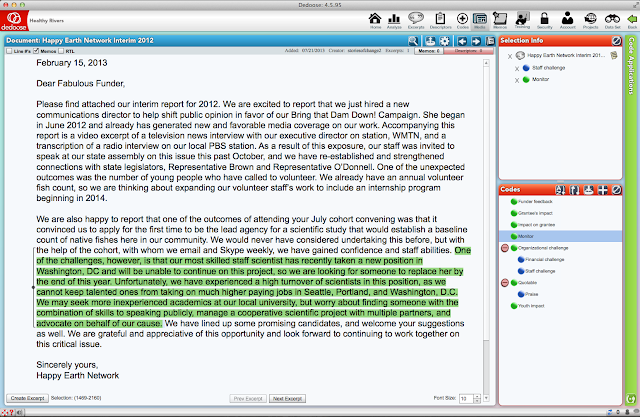 But, I stumbled on Dedoose for a project and found out first hand how they made this sophisticated program easy to use for any social change-oriented organization. What I love is that you can upload and code just about anything text or video based, it works on a Mac or PC, and it's remotely accessible as it is web- and not desktop-based. 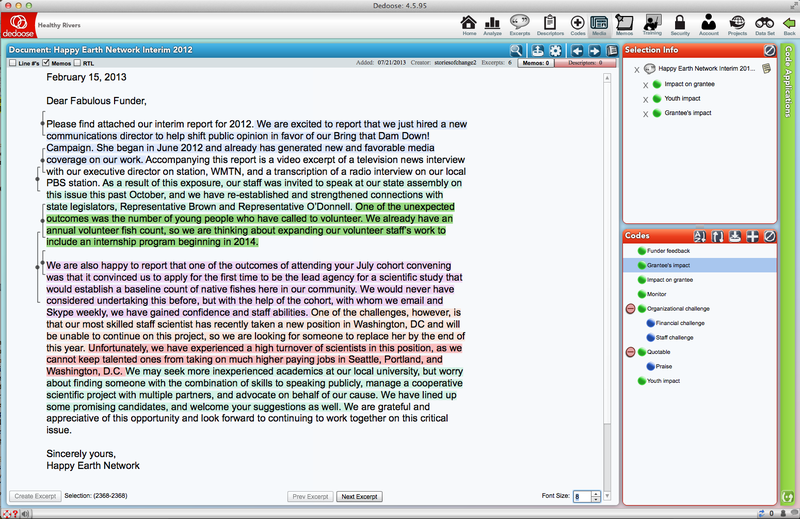 Dedoose will help you track, organize, and discern evidence of impact. So the next time you're asked for data about how your foundation's grantmaking is affecting your grantees or the field, you can say, "I can have it to you today!" Is Criticizing Private Foundations Anti-Capitalist (i.e., Marxist) or Pro-Capitalist? Working on a dissertation that seeks to address empirically the notion of private foundation effectiveness, I’ve been struck by two things: the lack of critical inquiry on this topic and how criticism of foundations has been stifled. On the first point, of course, people pontificating and expressing their opinions have spilled lots of ink, but much of this is subjective and reflects ideology not facts. Certainly, personal expressions by those knowledgeable about the field can be useful, but without including a critical, discourse-dependent approach to inquiry, conversations about private foundations neither become increasingly sophisticated nor elevated beyond a shouting match. This lack of scholarship is a far cry from my other academic experience, which was in art history, which I can’t help but use as a comparative foil. In my graduate studies in art history, I was bombarded with criticism—discourse on identity, how we perceive, and the notion of power and otherness. As frustrating as it was to be reading semiotics than visiting a museum, I appreciated being able to move beyond appreciating art on the basis of personal aesthetic pleasure to understanding the construction of meaning that says a lot about who we are as a people. In building my literature review of private foundations, there is very little critical study of its effectiveness. Hence, in the absence of empirical data, I’ve been mining references for different ways in which people have critically analyzed foundations, particularly around the notions of accountability and effectiveness. In that process, I found something interesting that has no room in my study, so I’ll talk about it here instead. There’s something odd and disturbing in how people treat those who criticize private foundations. This type of critic does not upset any apple carts and, in fact, makes the case for why those in power should stay in power: Elites still get to be elites, and their ability to self-initiate any improvements in charitable practice depends on them staying in power. This notion of philanthropic elites is an important notion well established by a body of research generated by a group of smart women whose names, coincidentally, all start with “o.” Odendahl (1990), Ostrander (1984), and Ostrower (1995) studied the elites and found that their participation on nonprofit boards and their charitable giving reified their elite status, placing them in a social circle of other elites and reinforcing class divisions between high and low. The other type of response to critics of private foundations is to accuse them as being a Marxist enemy of capitalistic and, hence, undemocratic. Take, for example, Fleishman’s criticism of Roelofs’s (2003) book “Foundations and Public Policy: The Mask of Pluralism.” Fleishman warned: “There is a small body of Marxist-oriented scholarship about foundations, much of it politically marginal and factually shaky” (cited in Van Til, 2008, p. 124). I’m both discouraged and ashamed that such a revered foundation scholar like Fleishman takes to dismissive name calling (come on, can’t we have an intellectual debate without accusing people of being a sickle-wielding communist?). Roelofs’s work has as much of an important place on foundation executives’ book shelves as Fleishman’s works do, particularly among funders who want to redress social inequities and not inadvertently re-institute them. Roelofs (2007) perceived private foundations through a critical lens of power and social inequities (listen up all you social justice funders!). She contended that private foundations reinforce the existing social order “promoting consent and discouraging dissent against capitalist democracy” (p. 480). For example, intellectuals who are disenfranchised by the existing social order and want to promote change often find an outlet in being employed within the nonprofit sector, such as private foundations. (This pretty much describes every smart, value-forward program officer I know.) By being employed in an industry that depended on capitalism for its success, these folks are quieted by their involvement in these civil society entities, which exerts a cooling effect on the possibility of a revolution that fights against the established hegemony (Roelofs, 2007). (Hmm, maybe Egypt’s best way to stymie revolution is to proliferate its own civil society institutions!) Roelofs (2007) posited that the United States is without the kind of protest movements that marked the 1960s and 1970s because of philanthropic institutions that exert social control: “Radical activism was often transformed by foundation grants and technical assistance into fragmented and local organizations subject to elite control” (p. 485). Does Roelofs sound like a revolutionary manifesto? Not to me, but that may be because I’ve felt personally the cooling effects of working for private foundations. Any program staff member who has worked for many years in a foundation (after the stars have fallen from their eyes) would likely find Roelofs’s message to be a no-duh, not a polemic. (Yes, working for foundations does provide wonderful opportunities to make change, but I’ll talk about those in another post.) There have been moments when low levels of wealth redistribution, which make no dent in addressing the gross inequalities and inequities in society, frustrated me. A concrete example of this is foundations’ efforts to pay out only the bare-minimum amount of 5% distribution of assets rather than give away more money to truly try and fulfill their missions. Hence, I welcome Roelofs's contribution to the literature, which helps funders be more enlightened about and effective in attempting to redress inequities--an effort that is directly in line with creating a more democratic society. In the last decade, there has been a renewed effort for ‘social justice philanthropy’ to try and solve inequities of resources, opportunities, and power. For those of you in that camp (and anyone else), you may be interested in learning more along the lines of what I’ve written about here. This line of thinking about how foundations reflect or fight the negative effects of capitalism is important because it helps illuminate how your foundation may be accidently complicit in re-enacting injustices. The learning from these writings is the intellectual basis for how your foundation can ‘move the needle’ permanently in your funding, rather than ‘move the needle’ temporarily as so many foundations do. There is a still-too-small body of writing that critiques private philanthropy but for more, start with Robert Arnove’s writings in the 1980s. He pioneered thinking about ‘liberal’ foundations that tried to fight inequities but actually ended up re-enacting socio-economic systems in grantmaking that corroded democratic accountability in decision-making. See also the special May 2007 issue of the periodical “Critical Sociology” critiquing private foundations, which includes an article by Feldman (2007) who attests to Arnove and Roelofs’s contentions by describing how progressive journalists and nonprofits avoid scrutinizing private foundations inadvertently because of subservience to private foundation funding. Roelofs, J. (2003). Foundations and public policy: The mask of pluralism. State University of New York Press.